This page is only intended for people who have specifically requested this sanctuary session from Free At Last Hypnosis. Please do not share it with others but instead ask them to go and request it themselves through our website. This 24-minute sanctuary session is specially prepared to help you create and visit your inner sanctuary of calm and silence whenever you need to regenerate your day. You’ll benefit from listening to this at least once every day for eight weeks and then as you feel you need it. Hypnosis and meditation share the quietening of the conscious mind so we can focus on relaxing and finding our inner peace. Unfortunately, it can be difficult to find the opportunity and time to to do it properly in a hectic day. The fact is, we only need a short session for it to be effective, and there’s no need for special equipment or clothing. You can listen to this session anytime. It is also beneficial to listen to it in the morning before you rise to start the day relaxed and invigorated, last thing at night to quiet the mind to get a peaceful sleep, or those times throughout the day when you feel the need to just recharge. To listen to the MP3 directly on an iPad or iPhone click on the special link below. 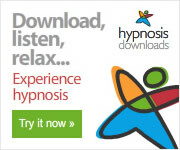 Listen to this hypnosis session whenever you need to go to that inner peace space in your mind. Please let me know how you enjoy this Sanctuary session. I am always eager to get feedback from people and you can contact me using the email address below or use our contact form on the Contact Page.